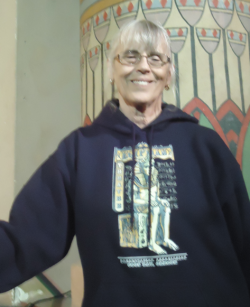 Karen has a relationship with the Egyptian Theatre that covers a span of 44 years. She was born and raised on a small farm in northwest Ohio. After completing her undergraduate degree she moved to Coos Bay in 1972 to begin a career as an elementary school teacher. After 16 years at Ocean Crest School in Bandon, she was a stay-at-home mom for 7 years, and then taught at Bunker Hill School for 16 years. She soon discovered the Egyptian and it quickly became her favorite place for watching movies. Karen’s relationship with her husband, Joel, began with their first date at the Egyptian in 1980, viewing the movie Airplane. After 35 years of marriage they were back at the Egyptian this past August to once again watch Airplane in celebration of their first date. While sons Isaac and Samuel were growing up, many enjoyable hours as a family were spent watching movies at the Egyptian. Although their sons are now men, the Egyptian Theatre is still on their “must do” list whenever they are home for a visit. Over the years her relationship with the theatre remains. After retiring Karen decided to begin giving back to the community by volunteering. Wanting to volunteer at a place she was passionate about with a flexible schedule, Karen found that the Egyptian and the Coos Bay Library fulfilled the criteria. She has found her niche with the Egyptian “family” and enjoys working concessions and at the Farmers’ Market, promoting the Egyptian.